These are NOT same details as TOAD purchase. Support login is emailed upon contacting support. This article covers both misfires basics and misfires advanced content (for expert DIY'ers or mechanics). A misfire is when one or more cylinders do not fire at all, at the correct time, or incomplete combustion occurs. If the misfire is severe enough, it may generate a flashing CEL or MIL to warn of a severely damaging misfire, or the light may come on solid if a less severe misfire is detected (which should still be fixed ASAP). Unless the light is flashing, the misfire may not be presently occurring because the problem is stored in memory for some time after the event. Misfires may or may not be felt by the driver depending on the severity. A cylinder needs the proper amount of air to fuel mixture, spark, and compression to fire. If any one of those is absent, mistimed, or sub-optimal, the cylinder will misfire. WARNING: Do not drive agressivley if flashing CEL and misfire occurs, let off gas immediately. If flashing and misfire does not stop when lowering engine load, pull over immediately. Failing to do so may damage expensive catalytic converters and/or cause permanent engine damage. First step to diagnosing a misfire is finding out what cylinders are misfiring, and when it occurs (under load, idle, when you let off the gas, etc). If your CEL is on, read the codes and figure out what cylinder is the problem, or if it is a random miss. You can read Check Engine Light (CEL) also known as the MIL (Malfunction Indicator Light) through the OBD-II port under the driver’s side dashboard using a scan tool like TOAD. Sometimes the PCM will not pickup on a misfire if it is partial or the monitor is not working correctly and the CEL may not light up even though you feel a misfire. If it misfires and doesn’t throw a code, you can do a power balance test to see which cylinder is misfiring. Unplug the plug wires from the coil one by one. Bad cylinders won’t change the idle when unplugged. By reading your codes, you can help diagnose which cylinder seems to be the problem. Before just randomly replacing parts, be sure you know which part is creating the problem. Part changing is an irrational way to attempt to fix the problem. Keep in mind purchasing low quality parts will sometimes hurt your problem rather than help it. Advanced User Misfire Diagnosis (good for those who don't have a CEL on but feel a misfire). Older spark plugs do not always fire correctly. Sometimes as plugs get older, they begin to fail at the same time. This may cause a random misfire (P0300). A poor firing spark plug or one that has a poor spark will casue a misfire. The first step would be to replace your spark plugs if they are old and have over 100k miles on them, they are going to need to be replaced anyways. Replacing plug wires is also a good idea at this time. At least inspect the wires for worn insulation and the plug boots for any cracking. You should also check your spark plugs for signs of arcing or carbon tracking on the porcelain when you take them out. If you see arcing, you need to change both the plug and the boot. Sometimes bad wires cannot be discovered without cutting them open. If you are out of ideas and have not replaced the plug wires, do so. On DOHC engines, oil on the outside of the plug can also contribute to misfires. In that case you need to change the valve cover gaskets and the O-rings surrounding the spark plug wells. Replace your spark plugs with OEM motorcraft (Part # AGSF-32FM), or Autolite double platinum plugs. Gap should be between 0.042 and 0.046 inches. Check for correct routing of the plug wires, sometimes they may be put back incorrectly after changing the spark plugs. However, the most common cause of an ignition misfire is a bad ignition coil. If misfire still occurs after replacing plugs and/or wires, or both plugs and wires are new, suspect a bad coil. Engines 1996-2007 generally use a single coil pack (contains three coils) for all six cylinders. For 00, 04, and 05+ Duratec engines, you have Coil On Plug (COP) ignition, which means individual coils are located on top of the spark plug, one per cylinder. Always inspect coils carefully for fine cracks (including the epoxy on the bottom of coil packs), which are a good sign the coil is bad (see video). Replace if you find cracks, or if the coil does not produce a strong spark with a spark tester attached. Some COP's can melt internally; remove and inspect them for melting. If you have a Vulcan OHV engine, you can perform a cylinder drop test to find which cylinder(s) are not firing. This test will also tell you if your coil is weak or bad. It's important to check for a strong spark (jumps about 1") because a weaker spark might cause misfires under load. A vacuum leak can cause a rough idle, misfire, and poor fuel economy. It is time to check if you have a vacuum leak. The most common leak is on 00-03 duratec and 01-03 vulcan motors where the PCV hose connects to the intake manifold with the PCV elbow. These elbows become oil soaked and collapse, creating a leak. This is located to the left and behind the throttle body, under the intake manifold for the Duratec. For the vulcan, PCV snaps/screws/presses (depending on year) into the valve cover nearest the firewall and the 90 degree elbow runs up and connects to the upper intake manifold. Most of the time when you have a vacuum leak, you will be showing lean codes (P0171 and/or P0174) along with the misfire code. Three easy methods to check for vacuum leaks include the cigar smoke test (blow cigar smoke into a vacuum tube, repeat, find leak), the propane torch test – turn a propane torch on with engine at idle and move it around the engine until the RPM raises, or the brake/carb cleaner test - take brake cleaner NON CHLORINATED or carb cleaner and spray it at all vacuum lines and at the UIM/LIM intake holes (where the gasket is), if idle changes thats where the leak is. Listening for a 'hissing' noise is usually a good indication you have a leak. Be careful not to spray brake or carb cleaner near or on exhaust parts such as the exhaust manifold or catalytic converters - this could cause a fire. Upper and lower intake manifold gaskets have been a problem with leaks on the Duratec, as well as the tubes behind the intake for the EGR system. The smoke test is good for finding large vacuum leaks. If you have a scan tool that can read fuel trims, watch the short term fuel trims on both banks when you spray cleaner or use the propane torch. You will see a quick, large change in the STFT if the cleaner or propane has found a leak. If you have a P0300 random misfire code, start by checking the fuel pressure at the rail with the Schrader valve and an inexpensive fuel pressure gauge. If you have a 03-07, you will need to use a scan tool to check this pressure. Random misfires are a bit harder to diagnose if they are the only misfire codes on the computer. The valve was removed either in april 2002 for vulcans and may 2002 for duratec's. The pressure your car should have at idle and under load depends on the year. For instance, 00-03 should be 40psi at idle and slightly more under load. If you notice the pressure is below 35psi, it could indicate a lean burning engine and possibly a misfire. If fuel pressure is low, first replace the fuel filter, if still low, you may need to clean the sock in the fuel tank, or replace the fuel pump. Another way to check for a bad fuel pump is by removing the vacuum line from the fuel pressure regulator. This only works on a 2003 or older vehicle as the newer ones compensate immediately and the scan tool will not show a change in pressure. If the pump is working correctly, you will see a 10psi or so rise in pressure after removing the line. The increase in pressure you notice “under load” is caused in the reduction in the manifold vacuum, so pulling the hose simulates this. To test if the fuel pump is functional, you should hear the fuel pump “prime”, or run for a second or two when you turn the key to the “on” position with the engine off. Gen 4 Tauruses (00-07) especially are susceptible to cracked fuel line connections right where the lines clip into the fuel pump assembly (strainer, pump, etc). That plastic is brittle on the assembly, is known to fracture, and can cause low fuel pressure. You can check for a stuck open injector by turning the car off and watching the fuel pressure. If one is stuck open the pressure will go down fairly quickly. The pressure should not change within 5 minutes. If you have a bad, clogged, or stuck closed injector, it may not let fuel enter the combustion chamber. You can check for a stuck closed injector by listening for each injector clicking with a screwdriver against the ear or with a mechanic’s stethoscope head to each injector body. A clogged injector might still click open and closed but still have very little or no fuel flow, so the only way to diagnose it is by seeing lean codes and ruling everything else out (ignition, compression, vacuum leaks) and isolating it to a particular cylinder(s) using a drop or power balance test. Injectors may also have electrical problems, which will throw some other codes. Refer to the OBD-II code list for other codes. Perform a dry and wet compression test. The cylinders compression should be within around 10% of the rest of the cylinders. This is an example, not to be taken for real data or real cylinder compression: If cylinder 1 had a dry compression of 100psi, and cylinder 2 has a dry compression of 92 psi you are still in an okay range. However if cylinder 3 has a compression of 80psi, that is more than a 10% difference and there may be serious engine problems. Another way to test compression is by performing a leak down test where compressed air is blown into the cylinder and is timed on how fast it leaks out. This is a very useful tool because you can listen to where the air is escaping to see where the leak is. For example hissing in the exhaust=exhaust valve, intake=intake valve, oil cap=cylinder rings, bubbles in coolant=head gasket. In many cases you will get lean codes (P0171, P0174, P1131, P1151) along with a misfire. If a fuel injector was clogged, the resulting lean mixture would cause the O2 sensor output to drop and remain "stuck lean". However, you have to be very careful interpreting O2 sensor readings when dealing with misfires because they're completely dependent upon whether combustion is occurring or not. O2 sensors only measure oxygen, not fuel. Remember that. In the next case, we have no ignition on a cylinder. The fuel injector is still injecting the correct amount of fuel, but the O2 sensor will also go lean. Because we haven't burned any of the oxygen in the cylinder. Another tricky situation a stuck-open injector. If the mixture is so rich as to not combust, the O2 sensor will go lean again even though the mixture is extremely rich (again because we haven't burned any oxygen). The last (very) common case are vacuum leaks. The ignition and fuel injection are working fine, but the extra unmetered air will cause the engine to run lean. So whenever you have a lean mixture with a misfire, it's important to first determine whether it's "real" or not. If the exhaust smells rich and the O2 sensors are lean, then you probably have an ignition misfire or a stuck open injector. Another important factor to consider is when the O2 sensors are going lean. If they're only lean at idle but operate normally while the engine is at cruise speed (~2000 RPM), then it's probably a vacuum leak. If the O2 reading is normal at idle but lean under acceleration, then you probably have a fuel pressure or clogged injector problem. On the 3.0L OHV (Vulcan) engine, a bad camshaft synchronizer (AKA cam syncro, syncro shaft, cam sensor) can also cause misfires. This type of misfire is distinguished because it only will occur at higher engine speeds (above 3000 RPM) and will result in a "bucking or jerking" feeling under acceleration. Usually you won't have any codes and the car will run just fine the rest of the time. The cause is the failure of bearings inside the camshaft synchronizer shaft (which takes the place of the distributor shaft the engine was originally designed with). In many cases, the bad bearings will cause a chirping noise at idle coming from the driver's side of the engine, which is another big clue. The bad bearings allow the shaft to vibrate at higher engine speeds, which destroys the crankshaft position signal and causes the fuel and spark to get out of sync with the engine. The performance of this sensor is not monitored above 3000 RPM, which is why you often won't get any codes for it. The only way to fix this is to replace the whole syncro shaft, not just the camshaft sensor puck that sits on top. In some cases the rotary vane will also destroy the sensor, so you might have to replace both parts. Please note that the syncro shaft also drives your oil pump, so delaying replacement may cost you your engine! If you want the fix to last, you must buy the Motorcraft part. The other remanufactured parts are inferior. Proper alignment of this shaft is important, so if you still have misfires after replacement you need to realign it correctly. 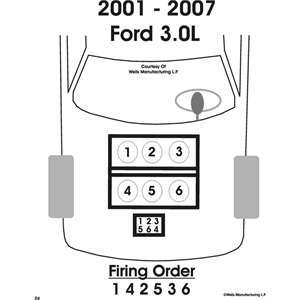 More information on how the misfire detection monitor works in early to mid 2000's Ford cars. This guide is written for savvy users who would like to get the most out of their OBD2 readers/scanners. If you're experiencing a very slight misfire or a misfire that only shows up under certain conditions, it can sometimes be frustrating trying to locate the source of the misfire if you don't have any trouble codes (maybe because somebody cleared them before you got to look at the car). Or perhaps you're stuck with only a P0300 or P0316 code that doesn't give you any cylinder specific information either. If you're in one of these situations, luckily Ford vehicles with OBD-II have a special cylinder-specific misfire count available inside part of the OBD-II specification called mode $06. Modes are just different sections of the OBD-II specification (SAE J1979) that deal with different functions. For example, stored DTCs are handled by mode $03, and freeze frame data is found in mode $02 (most scan tools rename the modes with their function so they're easier to use). Mode $06 is used to display specific test results used as part of the emissions monitors. For example, you can see the fuel tank pressure changes in all the stages of the evaporative emissions monitor (EVAP). To read mode $06 data, you will need a fully ELM327-compatible scan tool and software like TOAD - that supports mode $06. Okay, on to the real task! Mode $06 diagnosis. If you plug your scan tool into your OBD port and open TOAD, after connecting, you can go to the left side and click "Monitors". At the top you see several options. Click the "On-Board Monitoring" tab, and you should see the mode $06 data display after the scan tool polls the PCM. Note there is a refresh button at the top which you may want to use periodically while driving to update the data. 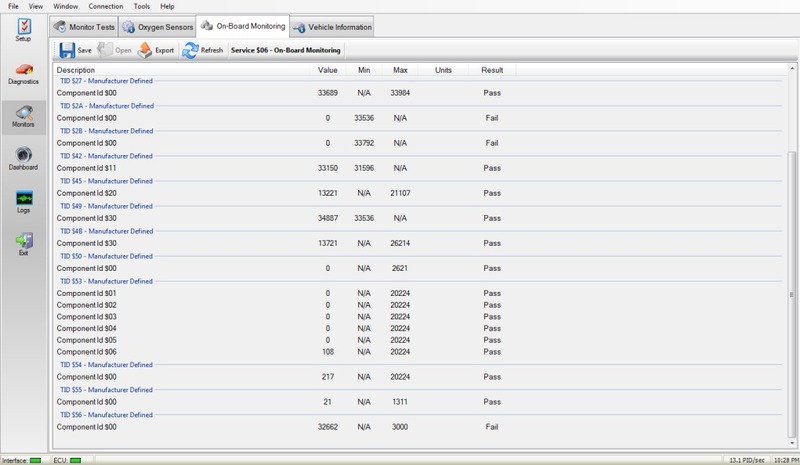 On the left you see a list of TID's (Test ID) and component IDs. These are used to reference the specific test result you want to find. In the center you see the current value, as well as the min and max thresholds for the test. Finally you see a pass/fail flag on the right depending if the value falls within the acceptable range. Again, if you want to know what all these numbers mean take a look at the OBD operation guide for your model year (see above). In general, TID's $50-$56 seem to be related to misfire monitoring on all vehicles. TID $56 seems to always be potential misfire events. I have a 2001 Sable, so my results are found under TID $53. You can see there are six component IDs ($01-$06) under TID $53 that correspond to each cylinder (a V8 would have eight obviously). If no misfires are occurring, you may only see one or two values show up rather than all six. I am not sure how often the data is reset or what period of time it represents. So if you look back at the picture you notice that my cylinder #6 has a reading of 108. Do the math and we get that cylinder #6 is misfiring 0.00162% of the time. That would mean the computer detects it misfiring 16.2 times per 1,000,000 revolutions of the crankshaft. Now that doesn't seem like a lot, but in reality this number is probably much higher because the PCM can't positively detect all misfires. If we do the same math with the max threshold (20224), we can see that the PCM will set a misfire code when the misfire percentage reaches 0.303%. That's 3000 misfires in 1 million revs. Look at the picture again and notice the value for TID $56 and the maximum threshold. I have obviously failed this test! These are potential misfire events. An event is any disruption in crankshaft acceleration, which can be caused by going over bumps in the road, the A/C compressor clutch engaging, or even just because of noise in the crankshaft signal. In order to count as a misfire, an event has to occur during a misfire check and have a certain acceleration profile, so the vast majority of events are not considered misfires (even if they are being caused by one). If more than a certain number of events (3000 in my case) are logged in a certain period of time (every key cycle) the PCM will do a 1000 rev misfire test to find out if the car is truly misfiring, and what cylinder/how often it is misfiring. This can only happen after the crankshaft profile correction portion of the misfire monitor has completed. Profile correction monitors crankshaft acceleration during a fuel-cutoff deceleration to "learn" the exact tooth profile on the crank position wheel. After a KAM reset or code clearing it requires you to coast (no brake) from 60-40mph 3 times to complete the monitor. There are several other misfire-related TIDs that are displayed as well. For the 2000MY, $54 is the percent of misfires that are catalyst damaging. If this number gets above the threshold it will activate the flashing CEL. $55 is the percent of misfires over the threshold for acceptable emissions. When this number gets above a certain number it will set a misfire code and illuminate the CEL. $50 is the total misfire rate for all cylinders combined. So what the computer actually reads as true misfires will pop up here as a percent. It's updated every 1000 revolutions (so it will read 0 except when your car misfires within the same 1000 revolutions of the crankshaft). How can I use these numbers to solve my misfire problem? The most useful value(s) in mode $06 are going to be the cylinder specific misfire rates under TID $53. If you see a value above zero for one or more cylinders, it's probably worth doing some more thorough checks on the coil, spark plug, injector, gaskets, or compression that corresponds to that particular cylinder. Seeing a very low number there (under 100) is not a great cause for concern, but you will probably notice the engine running rough at times, or perhaps the misfire will get worse with time. Either way, you should use mode $06 in combination with other scan tool data (DTCs, fuel trims, freeze frame data) to get a complete picture. NOTE: It is normal to see a very small number of misfires accumulate on all cylinders even with a motor that is running perfectly. Do not panic and start swapping parts because you see a number of potential misfire events with no symptoms. This is completely normal for a healthy motor - even a brand new car may show some. Keep in mind that after doing the math, these percentages are TINY unless you have a cylinder badly misfiring (which you will notice and will set a CEL!). Most of the time you should wait until the CEL illuminates to find the actual problem that exists. In the case of my Sable, troubleshooting is ongoing. I've already tried swapping the #6 coil with a spare I have with no change in the cylinder #6 misfire rate in mode $06. I'll update this topic if I find the exact problem. I never figured it out since I ended up selling the car. I have a misfire at cold startup with my 2008 which doesn't even show up in mode $06! So nothing to do about it but wait. Copyright © , TotalCarDiagnostics.com, All Rights Reserved.